Room Considerations: To get the best results, all aspects of the grow space should be optimized including: day and night temperatures, humidity, light levels, CO2 and air movement. Optimal Water Temps: Using a water chiller to maintain water temps between 65-68° will allow for the highest levels of dissolved oxygen and discourage proliferation of harmful bacteria to ensure explosive root growth. Cooler water temps in the system will also act as a heat sink in your grow space and allow for slightly warmer room temps required for full CO2 absorption. 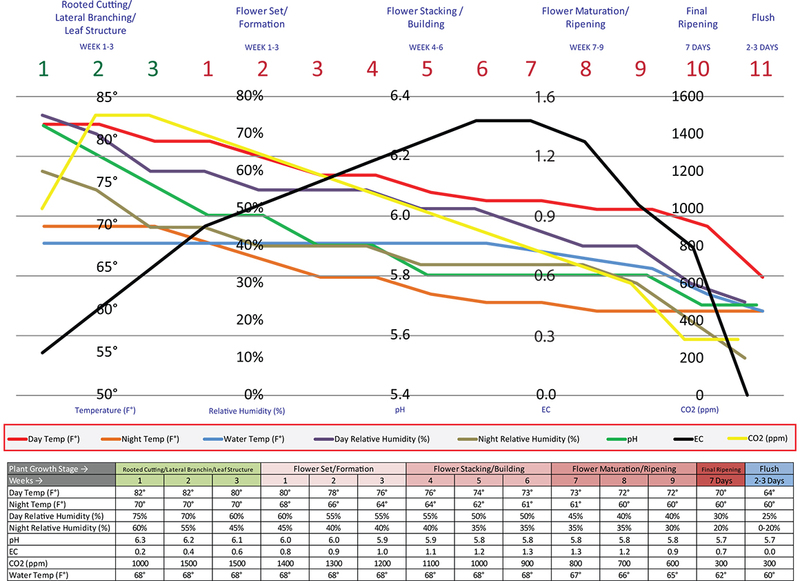 Water Levels: Water levels should be maintained fairly high throughout the growth and bloom cycle encouraging dense lateral root growth from the net pot. In the later parts of bloom and as roots fill the Growth Module, water levels can be incrementally adjusted down exposing more of the root mass. Creating drought like conditions in late bloom helps hasten flower formation and essential oil production. Top-Off Reservoir: Using a top-off reservoir will allow you to maintain consistent water levels and follow weekly feeding schedules without dumping valuable nutrient solution. When optimized, a top-off reservoir can be used like a doser for incremental EC/ppm adjustments and pH steering. Adjusting pH & EC/ppm: Adding concentrated pH adjusters or nutrients directly to the system may result in extreme plant/root shock. Anything added directly to the system should be diluted to at least 20% and added slowly. For best results pH and EC/ppm adjustments should be done through the top-off reservoir. Nutrient Considerations: Highly chelated, clean, synthetic nutrients have proven to work best in water culture both for their pH stability and ability to stay viable in solution for longer periods. Adding organics, sugars, bacteria, and zyme products have shown to create potentially harmful biofilms, hinder pH stability and require more frequent nutrient change outs. Nutrient Strength: we typically recommend starting between ¼ and ½ strength of standard nutrient recommendations. When starting with rooted cuttings transplant into the system at 0.3 EC or 200ppm and increase 10-20% per week based on plant performance. **When supercharging aeration levels nutrients should be reduced even further. Nutrient Change Outs: When plants are feeding and growing normally, full nutrient change outs are beneficial every 14-21 days. If pH levels become unstable or nutrient levels start to rise or stagnate this may be a good indication to do a full or partial change out. When using more complex nutrient recipes or heavy organic inputs more frequent (every 7-10 days) nutrient change outs may be necessary. Cleaning the System: Cleaning the system between runs is an important step to ensure harmful mineral buildups and biofilms are removed before restarting. Fill the system with plain water and a cleaning solution such as bleach. Cycle the system for 24hrs, scrub the modules and bottle brush the joints and manifolds. Thoroughly rinse the system and any debris, allow to completely dry before filling to start a new cycle.